Artist Code: 0005. Completed June 2002. Original SOLD. Water colour. Unframed size 12” x 16”. SOLD to private collector November 2014. 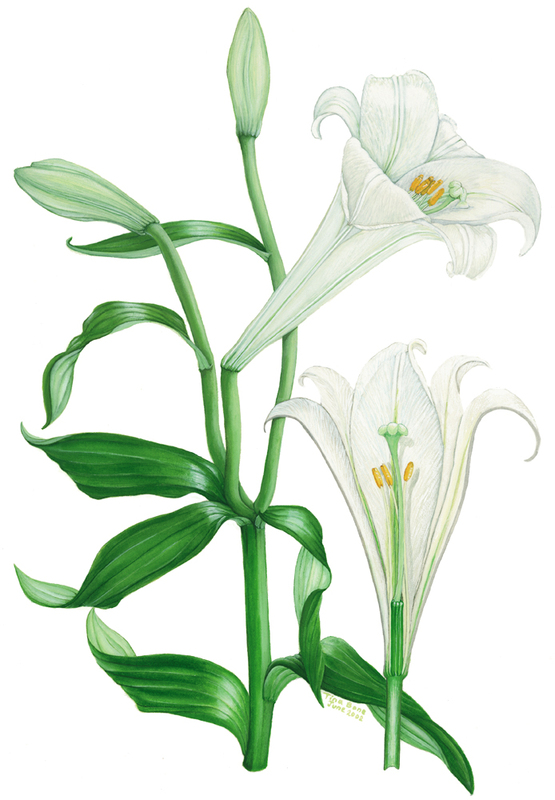 White lily, Easter lily, Lilium longiflorum. In November 2015, I was approached by Grace Cole Limited, who “produce award winning bath and body products, cosmetics and beauty gifts—the UK’s finest bodycare products” (Cheadle, Cheshire SK8 3SR), and was asked if they could use this lily picture to promote a new brand they were bringing out in 2016. 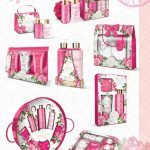 Contracts were signed and they are licensed to use the artwork on packaging for one year, in the first instance. Known as the Easter lily, Lilium longiflorum, this is an early botanical study of mine, an exotic flower which left yellow stains all over my carpet as it faded (and which I failed to notice until too late—new carpet!). The melded beauty of the leaves and eloquent bulging of the buds of this plant, I think, surpass the elegant flower trumpets. I included this painting in one of my calendars, and also included the initial sketches. I found the composition and painting of this picture very challenging. To show undying love demure.